One day I'd like to see Nicholas Cage act in a way that doesn't make him look like an escapee from Arkham Asylum. Perhaps a slow-moving drama by Claire Denis, in which he sits alone at a kitchen table toying with an empty cup. Libraries attract wacky people, and in the National Treasure films the greatest library of them all attracts Hollywood's wackiest action star. 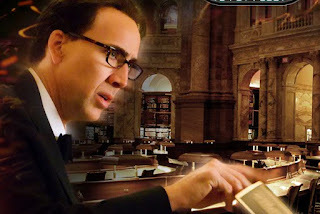 The Library of Congress is visited by cinema's Tasmanian Devil in the first National Treasure because he wants to do research on how to steal the Declaration of Independence from the National Archives. In the sequel, he breaks into the Library so that he can read 'The President's Secret Book.' In a Purloined Letter style trick, the book in which successive Presidents write state secrets about aliens, assassinations, being Muslim... that kind of stuff, is stored in one of the rooms overlooking the library's Round Reading Room. Never mind that POTUS would look a little conspicuous perched up there reading about how Elvis is running black-ops CIA missions in North Korea. As this globetrotting film is held together by little more than its action set-pieces, we needn't worry that hiding a book in a library makes about as much sense as a Dan Brown plot. 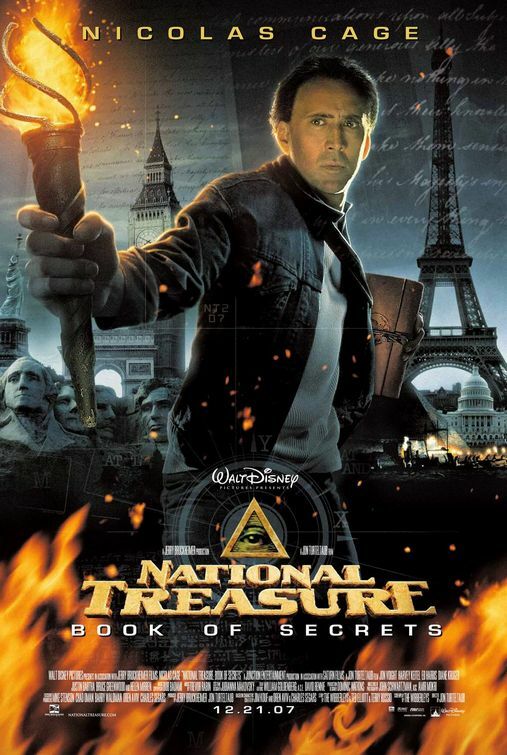 In an attempt to reach out to popcorn-munchers who know little, and care less, about their de-facto national library, the Library of Congress went out of its way to promote its involvement with National Treasure: Book of Secrets. Their Director of Communications blogged that 'the film has the potential to redefine the Library of Congress in the eye of movie-goers, much the same as the iconic shot from the dome of the Main Reading Room did for previous generations in "All the President's Men"'. Alas, the National Treasure films are nothing like All the President's Men. They are derivative and joyless, as hyperactive and intellectually stimulating as a game of Snap. Labels: 2000s, action/adventure, all the president's men, diane kruger, film, jon voight, justin bartha, library of congress, national libraries, national treasure, nicholas cage, washington d.c.
'Derivative and joyless'? I thought they were entertaining and fun, especially the first one.